There’s no doubt parenting is hard, and it certainly seems like it’s getting harder. Parents, however, don’t have the luxury of either giving up or giving in. 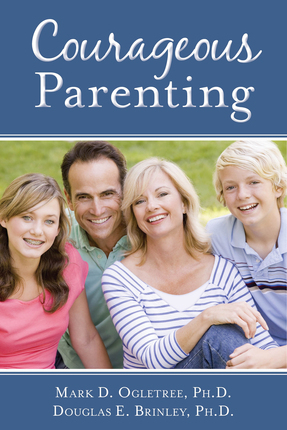 Authors Mark D. Ogletree and Douglas E. Brinley, with decades of combined experience as marriage and family therapists, encourage parents to redouble their efforts in Courageous Parenting. Learn how to raise independent, strong kids in the face of declining moral values, avoiding parenting traps along the way. Mark D. Ogletree was raised in the great state of Texas, and joined the Church at age eighteen. He served an LDS mission from 1982–1984 in the Washington Seattle Mission. After returning home from his mission, Mark attended Brigham Young University where he earned a BA in 1987. He earned two MA degrees from Northern Arizona University, one in education in 1990; and one in mental health counseling in 1994. He earned a PhD in family and human development from Utah State University in May 2000. Mark taught in the Church Educational System for twenty-one years, serving as a seminary instructor and principal, as an institute instructor, and as the director of the Institute of Religion in Dallas, Texas. He has also presented marriage and family workshops in the private sector, as well as at BYU Education Week. Presently, Mark is an associate professor of Church history and doctrine at Brigham Young University where he teaches courses on living prophets and preparing for marriage. Mark has also worked in private practice for over twenty years as a marriage and family therapist. He is the coauthor of several books on marriage and family issues, including First Comes Love and its sequel, Then Comes Marriage (coauthored with Douglas E. Brinley), and Scripture Study for Latter-day Saint Families: The Book of Mormon (Coauthored with Dennis H. Leavitt, Richard Christensen, et al.). Mark has also published chapters in other books, journals, and the Ensign. Mark is married to the former Janie Cook. They are the parents of eight children and have three grandchildren. In addition to church activities, Mark enjoys playing racquetball, softball, golf, remodeling his home, and taking trips to the lake with his family. Douglas E. Brinley is the author of many books and tapes on strengthening marriages and families, including Between Husband and Wife. A professor in the department of Church History and Doctrine at BYU, Doug and his wife, Geri, are the parents of six children. He holds a master's degree in Economics from Utah State and a doctorate from BYU in Family Studies. He served as a mission president in Dallas, Texas.